← HUGE Messianic Playlist on Youtube. Most in Hebrew! Clearly, the Messiah was present at or, actually, before Creation! It acknowledges the presence of ‘the Word of the Lord’ at Creation and in dozens of other places in the Torah! So, Was Jesus/Yeshua at Mt. Sinai? Let’s consider one other concept, before answering that. Even if they do not always agree on the finer points of the ‘echad’ (one/united) nature of the Father and the Son, Christendom widely regards Jesus/Yeshua as being of the same essence, and in perfect unity with the Father. Messianic Rabbi Itzhak Shapira would argue for Yeshua as a ‘manifestation of the Father,’ demonstrating one perspective of the connection between Father and Son from a very Judaic source. So, knowing that Jesus/Yeshua was at Creation and acknowledging His unity with the Father, was He at Mt. 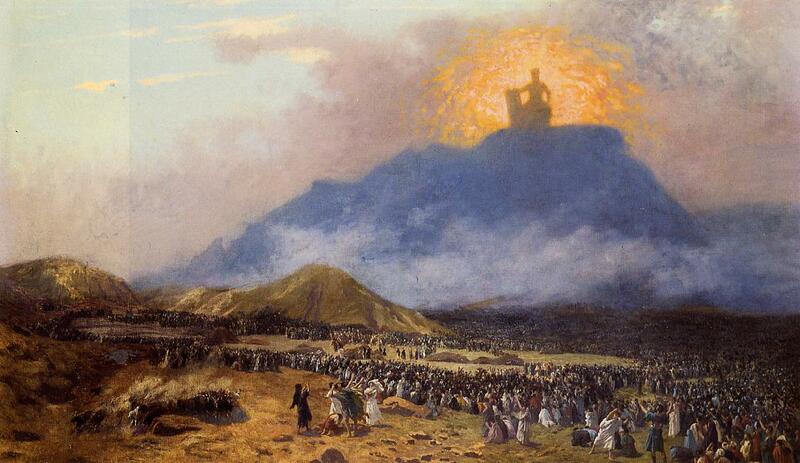 Sinai during the giving of the Torah? Frankly, that seems like a total ‘no-brainer,’ but prior to digging deeper in the Scriptures, I’m not sure I ever contemplated the answer, or more importantly, the implications!! Then Moses went up [a]with Aaron, Nadab and Abihu, and seventy of the elders of Israel, 10 and they saw the God of Israel; and under His feet [b]there appeared to be a pavement of sapphire, [c]as clear as the sky itself. 11 Yet He did not stretch out His hand against the nobles of the sons of Israel; and they saw God, and they ate and drank. Besides having this wonderful flavor of the Divine Holy One desiring so much to be with His people and seeing that desire manifest again at the ‘Last Supper’ as He eats with His people, this is an amazing account of humans in the presence of the Living God. BUT, can humans see God the Father face to face? I think it is clear from multiple angles that Jesus/Yeshua was on Mt. Sinai, and He is the One Moses spoke with and the elders ate with. And it was the third day at morning; and there were voices, and lightnings, and mighty clouds upon the mountain, and the voice of the trumpet exceedingly strong; and all the people trembled who were in the camp. And Mosheh led forth the people out of the camp to meet the Word of the Lord; and they stood at the lower parts of the mount. The theological and doctrinal implications are staggering. Ponder the sheer gravity of that statement and its implications! Do you know what His commandments really are? Other related thoughts: James 4:12 refers to Yeshua as the Lawgiver. Could Yeshua die for a covenant His Father made? Or, was He ‘sent’ before the covenant was made, and was HE the One who made the covenant with Israel, the Bride? Oh, the depth of the riches [a]both of the wisdom and knowledge of God! How unsearchable are His judgments and unfathomable His ways! 34 For who has known the mind of the Lord, or who became His counselor? 35 Or who has first given to Him [b]that it might be paid back to him again? 36 For from Him and through Him and to Him are all things. To Him be the glory [c]forever. Amen. Added 3/24/14: Here is an excellent post I was reminded of that deals with this same topic from some different directions further confirming the presence of Yeshua on Mt. Sinai! This entry was posted in Angel of the Lord, Deeper Study and tagged Apostle Paul, civil law, doctrine, Jesus, judge, law, Mt. Sinai, reformed theology, roman catholic, the Lawgiver, theology, Torah, Yeshua. Bookmark the permalink. 71 Responses to Was Jesus on Mt. Sinai? Does it matter? Good Platform to learn more of word God.I am grateful. Thanks a lot. Yes, It was Christ Himself as God in nature or as an angel of the Lord who gave the law to Moses. This is confermed in the New Testement as truth. See Acts 7:53, 2 Corint. 3:3 and Galations 3:19. THESE TRUTH CANNOT BE DENIED. More at Sabbath Light Ministry! Very interesting! The one thing that has helped me to understand this, particularly about Echad vs Yachad, is the fact that I am ONE person, I am Jennifer…and YHVH knew me before I was born, so I existed before I was born as a flesh & blood person, was manifest as a human being…but I am also a daughter, a sister, a wife, and a mother. Hmmm…Are those different manifestations, or are they different roles/responsibilities. Echad is ONE, becoming many, while Yachad is many becoming one, as in the Body of Messiah. Does that make sense? I don’t have a “ministry”, and I thought I would throw this in, to shed some light…you all can throw it out if you want. Like a lot of people, my life was a mess, many years ago, and Abba YHVH took my mess, and turned it into a message, and has given me a ministry, although it is an informal one…and what I share doesn’t cost anyone any money. It was freely given to me, so I freely give it to others. One more thing, as I have perused this site, I have been captivated by the farming aspect of earthly living. I separate our ives into what I call “sweat of the brow” crops and “dress the Garden” crops. We plant, plow and harvest certain crops, but sometimes, YHVH surprises us with, for instance, “white mulberries”, which we did NOT plant! He has also given us regular mulberries, and a black raspberry bramble at the back of our property. Someone shared with us some “winter onions”, which come back by themselves, year after year, and there are crab apple trees that have grown up on the property, among other gifts. Of course, we can use those fruitful gifts! We have “stalked the wild asparagus”, but since have started our own asparagus bed, which grows on it’s own year by year, once established. We only have 2 1/2 acres, but for a little over 40 years, have eaten produce from this small parcel. We do use the “system”, now, more than we ever did, since we have gotten older. Before we grew almost all our own crops in 3 30′ by 40′ foot plots…and we canned, froze & dried food. One year, I picked apples in a local orchard and each day, I was allowed to bring home a bag of windfalls, which we would process after my husband and I came home from work, and the kids finished school…we would clear the dishes and peel apples to freeze, or dry, or make apple sauce or apple butter. Same with Brussels Sprouts…we would have an assembly line and pick over the Sprouts, blanch them and freeze them on cookie sheets before transferring them to bags for storage in the freezer. We also planted a Saskatoon (Serviceberry) tree, which is ripening as I write this. Yum! We ALL need to think these things through, about YHVH and His Son, Messiah Yeshua…so that there isn’t a “mess” in Messianic! Too many of us have our own presuppositons, and are more than willing to beat others over the head with them! There really is so much to learn, and we must be gracious to one another. For instance, I haven’t read anything about the Covenant of Moab on this site. Everyone really should investigate it, as understanding this helps clear up a lot of the confusion about which “Law” was “added because of transgression”, and which covenant of Hebrews was the “old covenant”, which was “becoming old and obsolete and was passing away”. Since, according to 1 John 3:4, “sin is transgression of the Law”, which “Law” was John talking about? At Sinai, there was NO Levitical priesthood, NO tabernacle/temple, and NO prescribed altar sacrifices for sin! Sinai was shortly after Israel left Egypt, whereas Moab was approximately 39 1/2 years later, just outside the Promised Land, and did contain instructions for those added things. This understanding did NOT originate with me, Check out creatorscovenant.org. Also, see Galatians 3:15, for further information. We ALL desperately need this information! And, BTW, we are NOT being “reformed”, but TRANSFORMED! Reformation is external, transformation is INTERNAL! Just as motivation is external and INSPIRATION is INTERNAL! Also, I want to throw this in, too…the difference between a test and a temptation: The tester wants us to pass, the tempter wants us to fail. YHVH tests us, but never tempts us! Ha Satan tempts us! BTW, my favorite prophetess in the Tanakh is Hulda, which means “weasel”. A very ordinary woman, with a more than ordinary name, but was used by YHVH. Baruch B’Shem Yeshua, (The Lion of the Tribe of Yehudah, who upholds the Torah and abolished sin) NOT Gentile, Aryan jesus, who abolished the Law/Torah of YHVH and upholds sin!